Where to eat a Caribbean brunch? We found Three Little Birds in Brixton, South London. This Jamaican inspired independent restaurant and rum bar is small, with big character. 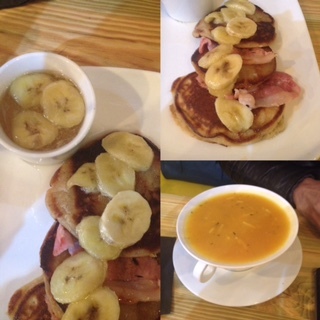 Their pancakes, with rum sauce are amazing! This is a Caribbean restaurant in London to check out and let us know what you think, by taking the anonymous poll below and leaving any comments. Caribbean brunch time, with pumpkin soup. A curation of who’s cooking in the African-Caribbean food scene.